Can someone (please!) give me a good stat build for a dual raider? For stats build, I can suggest the following one. As the main source of AP is from STR/DEX, I have them both to a pretty high amount. 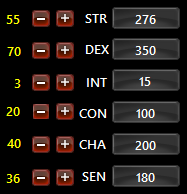 200 CHA to assist your self buffs, debuffs (Defense/ Accuracy/ Movement speed/ Attack speed Down), or knives' DoT (Damage over Time) if you have them. The rest come to CON/SEN. Edited by thetrangdamvn, 08 October 2017 - 05:49 PM.